The Connacht scrum-half hopes to return in the coming weeks ahead of the Six Nations. Marmion hasn't played since the November win over the All Blacks. 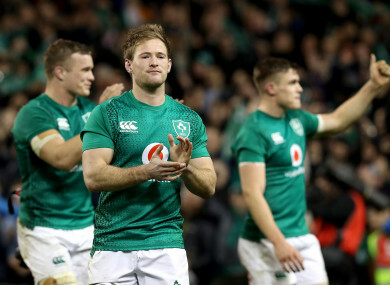 KIERAN MARMION IS set to give Joe Schmidt some badly needed news on the scrum-half front after confirming he is on course to be back for the Six Nations. However, it remains to be seen if he will be fit for the opening clash against England on 2 February and might not be back until Ireland travel to Scotland a week later. The weekend injuries to Luke McGrath and John Cooney has created a headache for Schmidt as he plots the defence of the Grand Slam, but Marmion said he is on course to return on schedule. “Everything is going to plan. I just started back running again now a week or so ago. Everything seems to be going fine. Hopefully the next few weeks and I will be able to get back out there and play,” said Marmion, who will be 27 next month. He won his 24th cap in the November win over New Zealand and then underwent surgery a few days later on a troublesome ankle injury. Marmion said that his first task will be to get back into the Connacht side where Caolin Blade, who could be catapulted into the Irish scene if the scrum-half injury problem worsens, has been superb over the past few months. “He has been going really well,” added Marmion. “I have a good battle there to get back in the team, but that’s good competition and it will drive me on. “The thing I am aiming for is just to get back and get some game time under my belt, especially with Connacht. That is my aim short-term at the moment. Just getting back on the pitch but thankfully that looks like it is on course. Email “Marmion hitting the right markers on comeback trail from ankle surgery ”. Feedback on “Marmion hitting the right markers on comeback trail from ankle surgery ”.